Ardea goliath egg, Muséum de Toulouse. The Goliath heron (Ardea goliath), also known as the giant heron, is a very large wading bird of the heron family, Ardeidae. It is found in sub-Saharan Africa, with smaller numbers in Southwest Asia and the Indian Subcontinent. This is the world's largest heron. The height is 120–152 cm (47–60 in), the wingspan is 185–230 cm (73–90.5 in) and the weight is 4–5 kg (8.8–11.0 lb). Among standard measurements, the tarsus measures from 21.2 to 25.5 cm (8.3 to 10.0 in) and the wing chord averages around 60.7 cm (23.9 in) in length. The culmen measures from 18 to 20 cm (7.1 to 7.9 in), while the bill from the gape measures around 24 cm (9.4 in). In flight it has a slow and rather ponderous look and, unlike some other herons, its legs are not held horizontally. Male and female look similar, with an overall covering of slate gray and chestnut feathers. The head and its bushy crest, face, back and sides of the neck are chestnut. The chin, throat, foreneck and upper breast are white, with black streaks across the foreneck and upper breast. The lower breast and belly are buff with black streaks. The back and upper wings are slate-grey, with a chestnut shoulder patch at the bend of the wings when they're closed. The under-wing is pale chestnut. The upper mandible is black and the lores and orbital areas are yellow with a greenish tinge. The eyes are yellow while legs and feet are black. Juveniles look similar to the adults, but are paler. The only heron with somewhat similarly-colorful plumage characteristics, the widespread purple heron, is much smaller than the Goliath. Despite the shared plumage characteristics with the purple species, the closest extant relatives of the Goliath are considered to be the great-billed and the white-bellied herons of Southern Asia. Due to their large size, this species trio is sometimes referred to as the "giant herons". The Goliath heron has a distinct deep bark, often described as kowoork, audible from a distances of up to 2 km. A disturbance call (arrk), sharper and higher, can also occasionally be heard. A huh-huh is given during the crouched stage, while a krooo may be heard with the neck extended. Organ-like duetting has been reported at nest sites but has not been confirmed. The Goliath heron is very aquatic, even by heron standards, rarely venturing far from a water source and preferring to fly along waterways rather than move over land. Important habitats can include lakes, swamps, mangrove wetlands, reefs with few cool water, sometimes river deltas. It typically is found in shallows, though can be observed near deep water over dense water vegetation. Goliath herons can even be found in small watering holes. They have ranged in elevation from sea level to 2,100 m (6,900 ft). They tend to prefer pristine wetlands and generally avoid areas where human disturbances are a regular occurrence. Prey almost entirely consists of fish. The Goliath heron specializes in relatively large fish, with an average prey weight range in Natal of 500–600 g (1.1–1.3 lb) and length of 30 cm (12 in). Exceptionally, the largest fish targeted may measure 50 cm (20 in) although the heron may not be able to swallow prey up to this size. Small fish are generally ignored and the average Goliath catches around 2 or 3 fish a day. Breams, mullet, tilapia and carp have locally been recorded as preferred species. Any other small animals that they come across may be eaten, including frogs, prawns, small mammals, lizards, snakes, insects and even carrion. Its breeding season coincides generally with the start of the rainy season, which is around November to March. In some areas, breeding is year around, with no discernable peak season. Breeding may not occur every year. Fairly adaptable in their nesting site selection, Goliath herons generally prefer to nest on islands or islands of vegetation. The birds may abandon a nesting site if the island becomes attached to the mainland. Lakes or other large bodies of water usually hold colonies. They nest fairly low in variously sedge, reeds, bushes, trees or even on rocks or large tree stumps. The nesting dispersal seems highly variable as everything from a solitary pair (with no other Goliath nests anywhere near) to fairly large colonies have been observed, with no seeming local geographical preferences. Occasionally, they may join mixed-species colonies including other heron species, cormorants, darters, ibises and gulls. The breeding displays are not well known and may be subdued, due in part to breeding pairs possibly reunited year after year. The nests are large but often flimsy (depending on available vegetation around the nesting site), often measuring around 1 to 1.5 m (3.3 to 4.9 ft) in diameter. 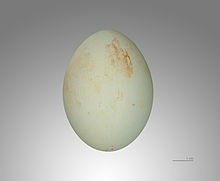 Eggs are pale blue, averaging 72 by 54 mm (2.8 by 2.1 in) and weighing around 108 g (3.8 oz). The clutch size can range from 2 to 5 (usually 3 or 4). Incubation lasts 24 to 30 days. Although they can sometimes replace clutches, often only around 25% of eggs succeed in hatching due to various environmental conditions or predation. The young are fed by regurgitation in the nest and, after a few weeks, can bill jab and practice defensive postures against each other. At around five weeks they leave the nest completely. The parents continue to tend to them for variously 40 to 80 days. Around 62% of fledglings who successfully leave the nest survive to adulthood. Locally, the white-tailed eagle and the African fish eagle may be a predator at colonies. Due its size and formidable bill, the full-grown Goliath heron may not have any regular avian predators. Despite their ponderous movements, Goliath herons can think quickly and often take flight before mammalian carnivores (such as hyenas or jackals) can predate them. ^ BirdLife International (2012). "Ardea goliath". IUCN Red List of Threatened Species. Version 2013.2. International Union for Conservation of Nature. Retrieved 26 November 2013. ^ Goliath heron – Ardea goliath. Oiseaux.net (2009-10-25). Retrieved on 2012-08-23. ^ Bonar, Christopher J.; Lewandowski, Albert H. (2004). "Use of a Liposomal Formulation of Amphotericin B for Treating Wound Aspergillosis in a Goliath Heron (Ardea goliath)". Journal of Avian Medicine and Surgery. 18 (3): 162. doi:10.1647/2003-003. ^ Goliath heron – Ardea goliath. Avis.indianbiodiversity.org. Retrieved on 2012-08-23. ^ a b c d e University of Michigan- Ardea goliath: INFORMATION. Animaldiversity.ummz.umich.edu. Retrieved on 2012-08-23. BonarVMD, Christopher J.; Lewandowski, Albert H. (2004). "Use of a Liposomal Formulation of Amphotericin B for Treating Wound Aspergillosis in a Goliath heron (Ardea goliath)". Journal of Avian Medicine and Surgery. 18 (3): 162–166. doi:10.1647/2003-003. Mock, Douglas W.; Mock, Karilyn C. (July 1980). "Feeding Behavior and Ecology of the Goliath heron". The Auk. 97 (3): 433–448. JSTOR 4085837. El-Naffar, M. K.; Khalifa, R. M.; Sakla, A. A. (1980). "Parasitofauna of the Egyptian aquatic birds. II. Trematode parasites of the giant heron (Ardea goliath) in Assiut governorate". Journal of the Egyptian Society of Parasitology. 10 (1): 107–116. ISSN 1110-0583. Hunter Jr., Malcolm L.; Calhoun, Aram; Wilcove, David S. (2004). "Goliath heron fishing with an artificial bait?". Waterbirds. 27 (3): 312–313. doi:10.1675/1524-4695(2004)027[0312:GHFWAA]2.0.CO;2. ISSN 1524-4695. Mock, Douglas W.; Mock, Karilyn C. (1980). "Feeding behavior and ecology of the Goliath heron". The Auk. 97 (3): 433–448. JSTOR 4085837. This page was last edited on 8 April 2019, at 11:14 (UTC).